Several members of the Woodstock Lions Club pose in front of a maple tree the club recently had planted in Woodstock Cemetery as part of its Cemetery Tree Project. Pictured, left to right, are Andy Heath, Ed Phillips, Bill Donohoe, Jackie Hayes, Dave Corbett, Kathy Williams, Susie Finley and Daryol House. WOODSTOCK – One of the most prominent features of many cemeteries throughout the country – old, massive trees that tower over the tombstones and monuments lining the grounds – have started to succumb to time, diseases and insects like the emerald ash borer. To help ensure trees continue to be a focal point at two of the largest cemeteries in Rush Township – Woodstock Cemetery and Maple Grove Cemetery (North Lewisburg) – the Woodstock Lions Club is sponsoring the Cemetery Tree Project, which aims to plant 100 trees in each cemetery over the next five years. “The ash trees are gone, the maples are dying of old age, and no one is replanting trees to restore the natural beauty of the cemeteries,” said Woodstock Lions Club President Tim Kemper. “These cemeteries were plotted on peaceful parcels of land over two centuries ago. “Visiting a cemetery to pay respects to loved ones is an emotional experience that can be enhanced listening to the breeze blow through the leaves of the trees, and the shade provided can be soothing on hot days,” he added. 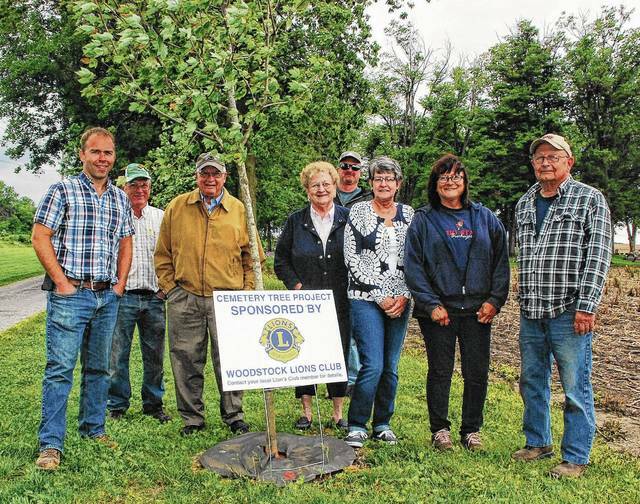 To kick off the project, which Kemper said was the idea of club member Kathy Williams, members of the Woodstock Lions Club donated 10 trees that were planted over Memorial Day weekend. Six were planted in Woodstock Cemetery, while four were planted in Maple Grove Cemetery. Individuals, groups and businesses wishing to participate in the Woodstock Lions Club Cemetery Tree Project can do so at a cost of $250 per tree, and along with receiving a recognition certificate, donors get to choose whether the tree is planted in Woodstock Cemetery or Maple Grove Cemetery. Kemper said Rush Township Trustees, with guidance from the Ohio Department of Natural Resources’ Division of Forestry Area 7 Service Forester Steve McGinnis, will choose the exact location within the cemetery where the tree will be planted and which type of tree will be used. Kemper said a lot of time and research went into selecting the right trees for the cemeteries. The four options available are oak, maple, poplar and thornless locust. Donations to the project can be made by calling 513-535-1671 or mailing a check to Woodstock Lions Club, P.O. Box 202, Woodstock, OH 43084. The next planting is planned for this fall, Kemper said, and a log book will be kept to show the location of each tree purchased through the program. https://www.urbanacitizen.com/wp-content/uploads/sites/36/2017/06/web1_Wdstock-Tree-Project.jpgSeveral members of the Woodstock Lions Club pose in front of a maple tree the club recently had planted in Woodstock Cemetery as part of its Cemetery Tree Project. Pictured, left to right, are Andy Heath, Ed Phillips, Bill Donohoe, Jackie Hayes, Dave Corbett, Kathy Williams, Susie Finley and Daryol House.